Erottajan Kasino is a long-standing event space that offers versatility, style and a dash of art. 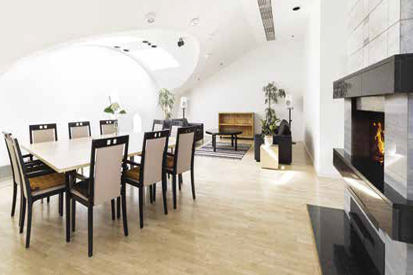 The central location in the capital, Helsinki, as well as the option to customise the space to suit your needs, make it the space of choice for high-profile events. Throughout his many years working in the hospitality industry, Mani Tehrani, CEO of Erottajan Kasino, had been dreaming of running his own business. The opportunity to do just that presented itself unexpectedly when a friend of a friend contacted him about fixing the door of a sauna a customer had broken on the premises – at the time, Tehrani had changed careers and owned a construction company. “Before long, I became a partner in the business and was running the event space myself,” Tehrani recalls. Erottajan Kasino is located high over the rooftops of central Helsinki. The building dates back to 1912, and the event space itself, converted from flats, comes with slanted ceilings, arched windows and plenty of light. 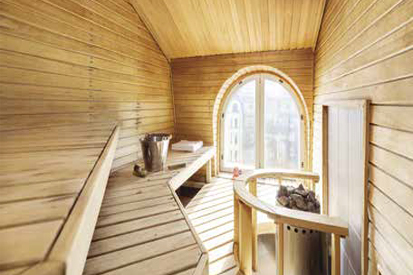 There is also a large balcony that allows patrons to take in the urban views, and, of course, a sauna. The space lends itself to organising many different types of events, from weddings to meetings, and can fit up to 70 people. “We are particularly accustomed to hosting high-profile customers, such as embassies and artists, and customers appreciate the option of bringing their own beverages,” Tehrani explains. Unlike at your regular event space, art is an important feature of Erottajan Kasino. The collaboration with artist Jaakko Mattila also began through a personal connection with staff, and his paintings have adorned the walls ever since. What next? Tehrani hints at plans of redecorating. “I am motivated by being able to respond to the challenges that organising different events brings, and helping people make their dream events a reality. Running your own business means you have to be ready to learn and grow – but the freedom it gives you makes it worthwhile,” he concludes.